Serious impetus to the development and production of its own air-air missiles was given when Chinese experts had access to missile systems for manufacture in China under license from Russia for the Su-27, and multipurpose aircraft systems Su-30MKK and Su-30MK2 imported from Russia. These included R-27R1 (ER1), R-27P (VC), R-27T1 (ET1), R-27P (VC), R-73E and RVV-AE (R-77). Sorting out Chinese missile programs is no easy task, given both the impressive diversity of these programs and the serious paucity of public information. This challenge is compounded by the relative lack of analytical attention to the question, as well as by the absolutely bewildering array of designations that are attached to each missile. A review of a number of apparently authoritative sources discloses persistent and irreconcilable differences in associating various designations with specific pieces of hardware. The paucity of specification data precludes robust reconciliation, and at least some authorities appear to have been led astray by a failure to contemplate pictures of the missiles in question. Service Designation - the publicly disclosed name apparently used by the Chinese military once a missile enters operational service [eg, YJ-8]. Builders Designation - the publicly disclosed name used by the enterprise developing the missile, both prior to and following acceptance for operational service [eg, C-801]. NATO Designation - the mnemonic names long familiar from their application to Soviet missiles [eg, SARDINE. DIA Designation - the alpha-numeric type designations, again familiar from application to Soviet systems [eg SS = surface to surface] , stylisticlly modified by the insertion of the modifying letter "C" [for China] at the appropriate point in the alphanumeric sequence [eg CSS-N-4]. The Chinese alpha-numeric service designators follow a reasonably rigorous pattern not too dissimilar from that used in the United States, and one which is a model of clarity by comparison with the practices of almost all other countries. The application of the "HY" designation is somewhat confusing to Westerners, since the other Chinese missiles using the "HY" designator are large coastal defense cruise missiles. The confusion is entirely of Western origin, since the Chinese characters for the Hai Ying [Sea Eagle] anti-ship missile and the Hong Ying [Red Tassel] anti-tank missile are readily distinguished. A rather more substantial source of obscurity arises in the case of the "PL" designation used for air-to-air missiles, which some sources elaborate as Pili [Thunderbolt] while others suggest Pen Lung [Air Dragon]. Although the service designators tend to follow a complete numerical sequence, this is evidently no more the rule in China than in America. The diversity of designation categories for some types of missiles, notably anti-tank and anti-aircraft, and may reflect industry rather than service designations, though this requires some further explanation. Aircraft "air-to-surface" armament is designed to equip the multi-role fighters Jian-11B are guided missile KD-88 representing the development of the similar class Russian X-29TE. By means of destroying targets at the surface of the earth also refers freely falling (gravity) and guided aerial bombs up to 500 kg laser-guided and cluster bombs, which are included in the set of weapons Jian-11. Missiles bombers represent anti-ship missiles (ASM) YJ -6 (C-601) KD-63, C-301, C-101, YJ-82, YJ-83/YJ-62 (C803), C-602, designed to equip long-range bombers H-6 recent modifications. Serious attention wasgiven by Chinese developers spend creating airborne cruise missiles for various purposes. The most perfect of them now is a cruise missile air (ALCM) CJ-10A long-range flight (2500 km), which may have a nuclear warhead. The term "Manpads" (acronym for MAN Portable Air Defense System) refers to portable surface-to-air weapon systems carried by humans (in one or two bundles) with a very short range (typically up to 5/6 km). The appearance and the multiplication of these materials constitute one of the major facts of battle order the second half of the 20th century. Since 1960, in the wake of the Americans and the Russians that they have much borrowed, industrial Chinese have developed and produced several generations of VSHORAD missiles. These are, in their chronological order: HN-5, QW-1, QW-2, QW-3, QW-4, FN-6. 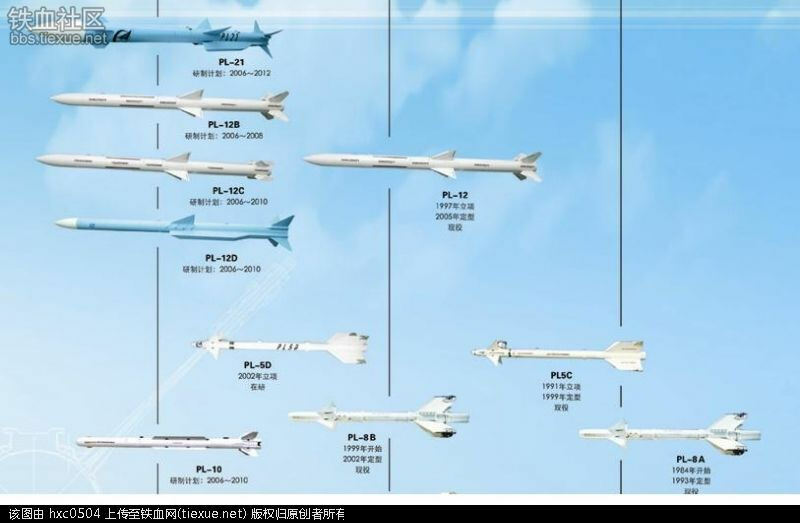 Having synthesized previously received Western and Russian technology development, Chinese designers have created their own line of modern small, medium and long range such as PL-5 modifications A, D, C, E, comparable performance characteristics with the American SD AIM-9H, AIM-9L or AIM-9P, PL8. Rocket design and performance characteristics are similar to the American AIM-132. Its feature is that virtually smokeless fuel, which makes visual detection of missiles. Chinese medium range missiles include PL-11 and its improved version of PL-11B active radar homing (RGSN) AMR-1 and PL-12 different modifications. Basic PL-12 missile has an active radar system final guidance and a maximum range of applications up to 60 - 80 km. Her modifications presented missiles PL12B/C/D. Last PL-12D is the most perfect, representing SD active radar homing, optimized for placing on the inner hardpoints promising aviation complexes 5th generation stealth technology. The multipurpose missile air-to-air PL-15 by weight and size resembles the last modification of the PL-12, with an active-passive homing and apparatus that provides two-way data exchange line with the carrier aircraft. Maximum range of the missile is about 100 km. At the final stage of development is the Chinese extra high-range PL-21 promising propulsive rocket engine, providing a range of application up to 150 - 200 km. Further complicating matters, the thrifty Chinese are not content to use a single missile for a single purpose, but are known to cleverly deploy the same missile in a variety of launch modes. This parsimony with respect to hardware imposes a penalty with respect to nomenclature, since the virtually identical missile will acquire a new set of designators once it is applied to a new mission or launch mode. Hence, the ship-launched CSS-N-4 SARDINE becomes the CSS-C-8 SACCADE when launched from the shore [in case you are wondering, SACCADE is "the movement of the eye from one fixation point to another" -- and SARDINE is "a small fish"]. Matters are further complicated by the fact that the readily accessible public record fails to disclose the fact of the existence of a variety of designations which are almost certainly in use by either the Chinese military or their observant counterparts in other countries [eg, the Chinese service designation for the SARDINE remains obscure, as does the NATO name for the CSS-N-5].